Despite safety regulations and improvements in safety practices, workplace accidents happen far more often than they should. In 2016, private industry employers reported almost 5,200 fatal work injuries, as well as nearly 3 million nonfatal work-related injuries, according to the Bureau of Labor Statistics (BLS). Workers fortunate enough to survive a serious on-the-job accident may be severely injured and unable to work, while medical bills and other expenses mount. Luckily, workers hurt while performing job-related duties may be entitled to compensation for their injuries and other losses. However, the path to obtaining compensation for a workplace injury may not be the same for all injured workers. While most workers find relief through the state workers' compensation system, others may be eligible to seek financial recovery in the civil court system by filing a personal injury lawsuit. In Delaware, workers' compensation is a system created by the state legislature to protect workers who are injured or contract an occupational-related illness while working. The Office of Workers' Compensation, which administers and enforces laws related to workplace accidents and safety, requires all employers with one or more employees to carry workers' compensation insurance. Additionally, workers' compensation is a “no-fault” system, meaning that workers aren't required to prove that their employer was negligent in order to collect benefits. In many cases, workers may even be eligible for workers' compensation benefits if they were at-fault for their injuries. However, there are some notable exceptions. In the event of the injured worker's death, benefits may be payable to the worker's surviving family members. For workers injured as a result of their own negligence, or the negligence of an employer or coworker, filing a workers' compensation claim is usually the most appropriate way to seek damages for an on-the-job injury. However, if the worker was injured due to the negligence of a third-party—such as someone from another company—he may have grounds for a personal injury lawsuit. The defendant owed the plaintiff a duty of care, such as to maintain the reasonable safety of the workplace. The defendant breached the duty of care. The breach of duty led directly to the plaintiff's injuries. 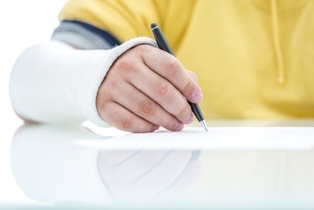 The plaintiff suffered economic or non-economic damages as a result of those injuries. Though the burden of proof is more difficult in personal injury cases, a knowledgeable attorney can help clients build and present a strong case. If you were injured on the job, you may find yourself wondering how you'll provide for yourself and your family while you're healing from your injuries and unable to work. The skilled attorneys with the Morris James Personal Injury Group can help you fight for the compensation you need and deserve—whether it comes from a workers' compensation claim or personal injury lawsuit. Contact us today to schedule an appointment for a free initial consultation to discuss the details of your case.